It’s not often that a piece of animal intelligence news gets wide exposure, but one Associated Press report is doing just that. Andrew Bridges writes that elephants show self-awareness when looking in a mirror. 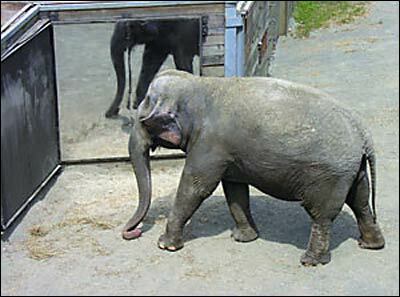 In a 2005 experiment, Happy [a 34-year-old female Asian elephant in the Bronx Zoo] faced her reflection in an 8-by-8-foot mirror and repeatedly used her trunk to touch an “X” painted above her eye. The elephant could not have seen the mark except in her reflection. Furthermore, Happy ignored a similar mark, made on the opposite side of her head in paint of an identical smell and texture, that was invisible unless seen under black light. “It seems to verify for us she definitely recognized herself in the mirror,” said Joshua Plotnik, one of the researchers behind the study. Details appear this week on the Web site of the Proceedings of the National Academy of Sciences. Only humans and chimpanzees — and, to a limited extent, dolphins — have been previously documented to possess self-awareness. This research, which needs to be replicated in order to gain validity, seems to indicate elephants have sentience similar to that of dolphins.